Special Purchase! 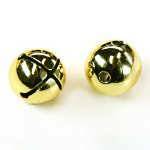 These jingle bells are 1" across and are made of steel with a deep gold-tone finish. The hole in the base is sized for use with 3/16" diameter blind rivets (aka "Pop" rivets) or self-threading sheet metal screws. When fastened to a leather or sturdy fabric strap, these bells sit flat on the strap. Blind rivets and sheet-metal screws are available at many hardware stores. Volume discounts for 2 or more packages (200 or more bells). Discounted price will be shown in your cart. Sold per package. Enter a quantity of 1 to purchase 1 package of 100 bells.